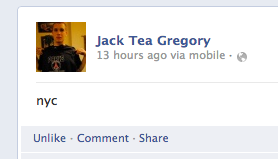 Jack took the bus down from Providence last night so he could vote today. It’s his first time voting and his first time home since going away to college. Tim and Joe went crazy when they first saw/smelled him.It’s been great to have him home, if even for just a few hours. We immediately slid back into old habits, ordered in Italian food, watched TV and talked about art. It was even nice to see Jack’s socks abandoned on the living room rug. Sadly, he’ll be back on the northbound bus before dinner. Sweet for you and the dogs and for Jack too! Watching our launched kids grow is amazingly wonderful. Enjoy! Hey Danny, I think your twitter account has been hacked. I have received a few direct messages from you with links and when I look at your feed there are suspicious posts. Looks like other people have received them too. You may want to change your password. When they leave, their returns are never long enough! That’s a fantastic feeling. I will be father soon and for now I can only imagine. Thanks!